This is the easiest way to make Peanut Butter Cookies that I have ever found. They are not as good as my Old-Fashioned recipe for Peanut Butter Cookies but if you don't have much time or just want something quick and easy, these will definitely do. They turn out super soft and taste really, really good. Open up your cake mix and pour the dry mix into a bowl. Add in the eggs, oil and peanut butter. Stir well. Roll the dough into balls and roll each ball into sugar. Place on a cookie sheet and use a fork to make the classic peanut butter cookie design on the top. Bake for 10 minutes. Allow to cool 3 minutes before removing from pan. Our family loves pizza and there is nothing more delicious than homemade pizza using crust and sauce your prepare yourself. Today, we are making my Homemade Barbecue Chicken Pizza. I know it may sound like an unusual combination but as a pizza, it is superb. Just imagine it: thick styled homemade crust, homemade barbecue sauce, shredded chicken and it is all covered with a heaping amount of cheese! Yum!!!! This will surely become one of your favorite pizzas ever. Place your shredded chicken into a bowl. Stir in one cup of barbecue sauce. Brush the crust of your pizza with the olive oil. Spread the 1/3 cup of barbecue sauce over the crust. It may not look like enough sauce but it is more than suffice. Sprinkle 1/2 cup of cheese on. Pile on the shredded chicken. Now put on the rest of the cheese. Place in a preheated 425 degree oven and bake for 10-12 minutes, or until crust is golden brown and the cheese is melted. Cut into slices, serve and enjoy! I often buy my ground beef in bulk because it is so much cheaper this way. I was speaking to a good friend of mine the other day at the grocery store and she said she never buys 5-10 pounds at a time because she didn't want it to go bad before she could cook it. I told her I cook 5 pounds at a time with very little work and she wanted to know how. I explained it to her and thought some of my readers may be intrigued also. So here is my technique for doing so. It is super easy. All you need to do is turn on your crock pot onto low and allow it to heat up for 30 minutes. Open up your package of meat (5 pounds) and put it in. Add in 1 cup of beef broth. If you have no beef broth, just add in 1 cup of water. The meat will still turn out flavorful and good even if you use water. It is just a bit more so with beef broth. Put the lid on the crock pot and leave it alone for 2 hours. After 2 hours, I stir up the meat and add in 2-3 T. of dehydrated chopped onions. You can add in salt, pepper, garlic powder, seasoning salt or whatever seasonings you prefer at this point. I only like to season my meat with onions because I use it in all kinds of dishes and only onions works best for all the meals I cook. After you add in the onions or whatever else you plan on adding in, stir again and replace the lid and allow it to cook for a few more hours. After the meat has been cooking for about 4 hours total, it is time to drain the meat and divide it up into freezer safe baggies. Easy-peasy. *****NOTE***** If you are using frozen hamburger meat, allow it to cook for 3 hours before stirring for the first time and allow it to cook for almost 8-10 hours total. The prepared hamburger meat goes great in tacos, Cheeseburger Casserole, Pizza Lasagna, and my Sloppy Joe Tater Tot Casserole. Other things I like to keep my freezer stocked with to make meal times easier include: Make Ahead Hamburger Patties, Freezer Biscuits, and Freezer Meal: Sweet 'n Sour Chicken. We live on a farm/homestead and my husband and teenage son do all the feeding and watering of all our farm animals; tend the garden; and take care of the property. They track in things all day and all night long. I can vacuum a few times a day but the carpets still smell. As you and I both know, carpets absorb ALL odors and instead of purchasing carpet deodorizers from the store, I prefer to make my own. My carpet deodorizer is fast & easy to make and uses all natural ingredients that leave a light, natural scent and not a heavily perfumed one and does not contain any harsh or harmful chemicals like the store bought kind do. It is so easy to do; it's inexpensive and is non-toxic! To make this, all you do is place 1 cup of baking soda into a medium sized bowl. Sprinkle in 10 drops of orange essential oil and 5 drops of Tea Tree essential oil. Stir well and pour the powder into a shaker jar. To use, sprinkle over your carpet and let the powder sit for about 5 minutes. After 5 minutes, vacuum as usual. Store the powder in a safe place, away from children, in a cool, dry place. I have even used this in my mini-van and it does WONDERS! Another tip, sprinkle a bit into tennis shoes. After a full day of my teenage son wearing his shoes, they can become quite smelly but this stops the problem. If you do not have any essential oils, you can used dried herbs. I like to use rosemary. If you like this, you'd probably also like my recipe for Homemade Air Freshener! Before I get started, let me say that this soup is not for everyone. If you hate pickles, of course, skip this recipe and try one of my other soups instead. I love dill pickles and I can only eat this soup once a year. The first bite kind of kicks you but the more you eat of it, the better it tastes. My teenage son took a bite and said "this is weird". Then he ate another bite; then another; then another. Next thing you know he is on his 2nd bowl and says "this is really good". If you love pickles or if you are adventurous, I do encourage you to give it a try. Wash & peel your potatoes. Cut them up into chunks, just like you would if you were making potato soup. (You can use hashbrown style potatoes instead. It tastes good either way.) Peel and cut up your carrots. Place both the potatoes and carrots into a soup pot and pour in the chicken broth. Turn on your stove to high and bring them to a boil. As they are boiling, get a medium bowl and stir together the flour, sour cream and water to make a paste. Set aside. Once the vegetables are boiling and the vegetables are tender, stir in the diced pickles. I used 4 dill pickles and once they were diced up, it equaled right at one cup. Turn the stove to medium-low. Whisk in the paste a little bit at a time. It will thicken the soup. Once it is all mixed well, stir in the pickle juice, spices and sugar. Cook on low for 5 minutes. Remove and serve. I LOVE potato soup. To me, it is one of the most satisfying; most comforting of all soups. This recipe makes a huge pot of creamy, delicious, and amazing potato soup. Not only do I love it but it is something my entire family (even my youngest son who is autistic) looks forward to with anticipation. During the winter time, I make this once a week and during the hot summer months, etc. I make it once a month. Yes, even during the summer this recipe is worth making. I hope you and your family enjoys it as much as we do and it becomes a regular for you too. Wash your potatoes well. Peel them and as you peel each one, place into a bowl filled with cold water. Pour the chicken broth into a large soup pot. Cut up your potatoes into small bite-sized chunks and add to your soup pot. Bring the potatoes to a small boil and cook until the potatoes are tender. Once the potatoes can easily be pierced with a fork, stir in the milk, butter, chicken bouillon and spices. Turn the heat to low, stir well and allow the pot to simmer for 10 minutes. Slowly pour in the instant potatoes. They add a lot of flavor and help to thicken the soup up a bit. I found this works so much better than adding in a roux. Our family loves mashed potatoes. I used to think there was not such a thing as bad mashed potatoes but have found out, that sadly is not true. I have tasted super dry mashed potatoes; soupy mashed potatoes; bland mashed potatoes, gummy mashed potatoes, etc. Today, I am going to teach you how to make perfect mashed potatoes every time. My techniques will show you how to whip up a batch in no time that turn out fluffy, light and buttery! First scrub your potatoes to remove all dirt. Next, peel your potatoes and cut them into uniform chunks. By cutting them all basically the same size, you ensure that the pieces get done all at the same time. 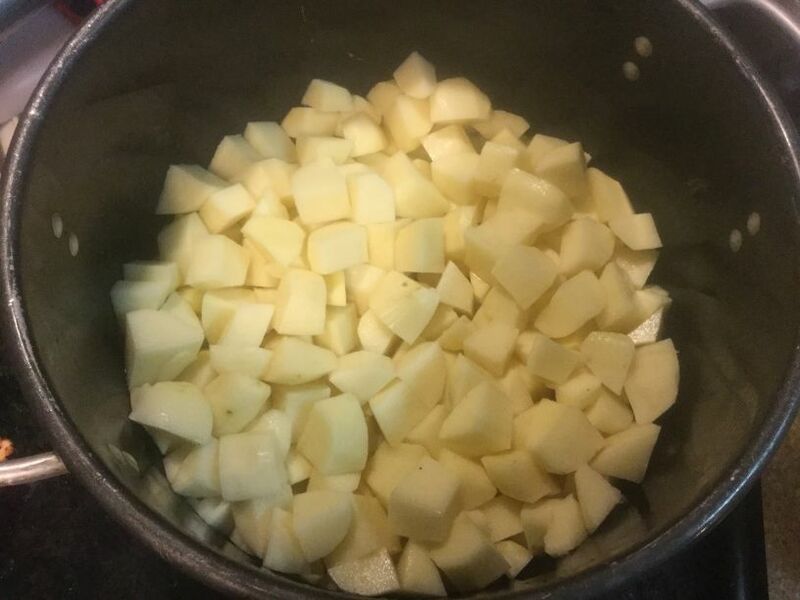 If you cut your potatoes and they are all different sizes then some will be done, some might be mushy and others not quite done. Cut uniformly to get them to cook uniformly. Place the potatoes in a pot. Pour in the chicken broth and add enough cold water to cover the potatoes. 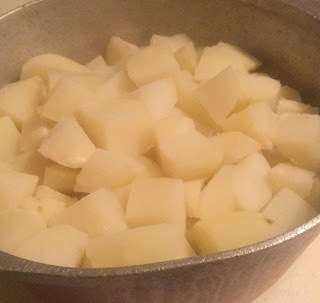 (Cooking your potatoes in chicken broth gives the potatoes so much flavor.) Turn your stove onto medium and bring your potatoes to a small boil and then turn to simmer and allow them to simmer for 20 minutes. Drain and return the potatoes to the pot. In a small pot, put your milk, butter, salt & pepper. Turn the heat onto medium-low and gently heat them up. Stir often and don't let the milk scald. When they are slightly hotter than warm, pour them in with your potatoes. Adding them in warm ensures you will serve your family/guests warm potatoes and not cold ones. 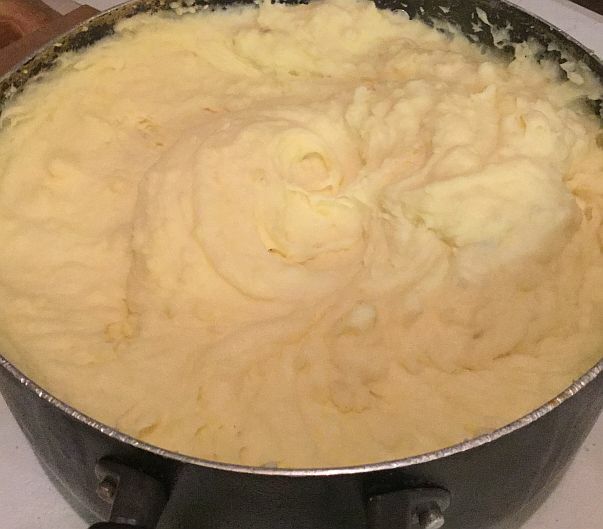 Using a potato masher, mash up your potatoes thoroughly. Add in a dollop of the sour cream. Use your mixer to whip them up the rest of the way. But do NOT over-mix. Potatoes are made of starches and starches do not like to be overmixed. Just like you can overwork bread dough, the same is true of potatoes. Remember the gummy mashed potatoes I mentioned earlier. They become gooey from overmixing the potatoes. If they are too thick, add in a bit more of the sour cream. Using a mixer, mix on low until the potatoes are smooth, light, and fluffy. Serve immediately. 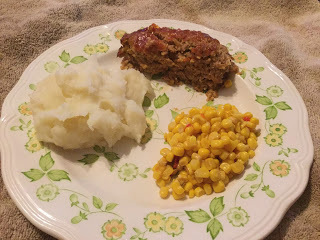 These mashed potatoes pair well with Meatloaf; Turkey; or even Pork Chops! Fresh vegetable pizza, not to be mistaken for a vegetarian pizza. They are NOT the same! A vegetarian is a traditional style pizza but made with only vegetables on it and no meat. This is NOT that. It is very different. It is so delicious. So quick and easy to make. In fact, I fixed this last night for supper and had 2 pieces and Ron and Bub finished the rest of it off. They kept on remarking on how good it was. I think they were surprised by how much they did like it. They usually require meat in every meal (being farmers and country men) but they said they didn't even miss the meat. Heat your oven to 375 degrees. Lightly spray a cookie sheet with cooking spray. Open up your cans of crescent rolls and flatten them up and press them into the bottom of the cookie sheet bringing up some of the dough up the sides to form a nice crust. Place in the oven and cook for 15 minutes or until the crust is golden brown. As the crescent roll crust is baking, prepare the cream cheese mixture. In a medium sized bowl, stir together the sour cream, cream cheese, mayonnaise and dry ranch dressing mix. Stir well. Once the "pizza crust" is done. Remove it from the oven and allow it to cool slightly. Now, take the cream cheese mixture you made a few minutes ago and spread it out all over the crust. I only used about half of my mixture. What was left over was a great vegetable dip for any left over vegetables you did not use all of. Now sprinkle on some cheese, as little or as much as you want. Slice your tomato or cut into chunks like we did. Place the tomato chunks around on the pizza. Cut your black olives in half and put them on your pizza. Then take your cauliflower and break up the head and sprinkle bite sized pieces onto the pizza. Take your carrots and cut off the ends and then using a vegetable peeler, peel the carrot(s). Place the peels of the carrot onto the pizza. Slice the cucumber and put onto the pizza. And finally sprinkle on some more cheese. Slice your pizza and enjoy. You can use whatever vegetables you and your family prefer. Sometimes we add broccoli, bell peppers and mushrooms but we just weren't feeling it when I made this one. I hope you like this recipe and will try it out soon. If you do, please come back and comment and let me know. I love hearing from my followers. This recipe pairs well with a light dessert like my Applesauce Puffs.